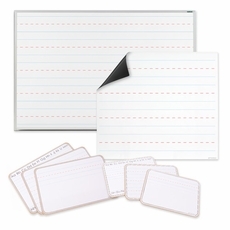 Mywhiteboards line of manuscript dry erase boards is the full compliment of tools for your classroom. We offer wall-mounted, handheld and our new roll up magnets. Design your lesson plan for full classroom engagement with a set of handheld boards for the students. 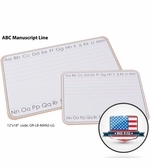 Our new manuscripts magnets are a great option for most classrooms. They stick to most any magnetic board and then roll up and store out of the way when not in use. 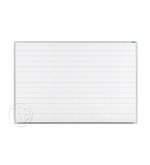 Our printed manuscript line boards feature our exclusive OptiPrint™ dry erase surface. The vibrant full color penmanship graphics are embedded under our premium dry erase surface. We proudly make these boards here in our U.S. factory. We can customize these manuscript boards to meet your needs, contact our Customer Service department for more information. We gladly accept school purchase orders. 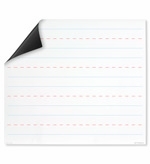 Economical dry erase manuscript boards.